We are here close to Ponte S. Angelo: Arco di Parma leads down to the river bank; it was one of the few accesses to it in this part of Rome. The view is taken from the green dot in the small 1748 map here below. 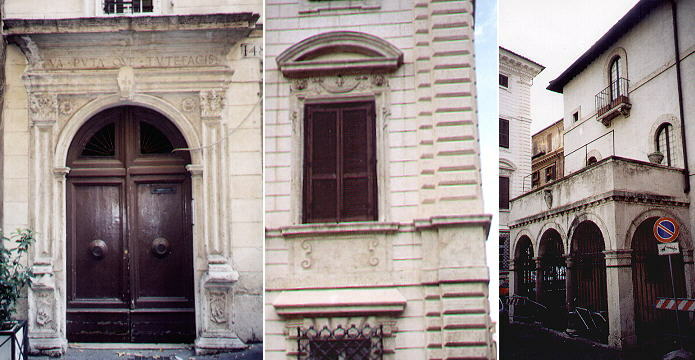 In the description below the plate Vasi made reference to: 1) Palazzo Lancellotti; 2) Other buildings adjoining Palazzo Lancellotti; 3) Arco di Parma; 4) S. Simeone; 5) Palace once belonging to the Cesi family. 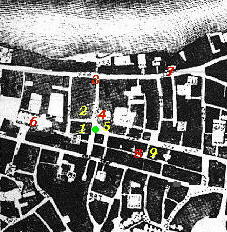 The small map shows also: 6) S. Salvatore in Lauro; 7) S. Maria in Posterula; 8) S. Salvatore in Primicerio; 9) Palazzo della Maschera d'Oro. The view is not much changed but rather than going down to the river now there are steps going up to the Lungotevere. 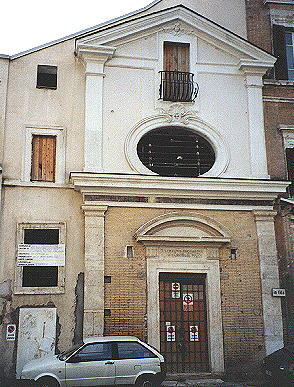 The little church of very old origin was entirely rebuilt by Cardinal Girolamo Lancellotti in 1610, mainly to retain a parish church next door to his palace. The façade is the only remaining part of the church . 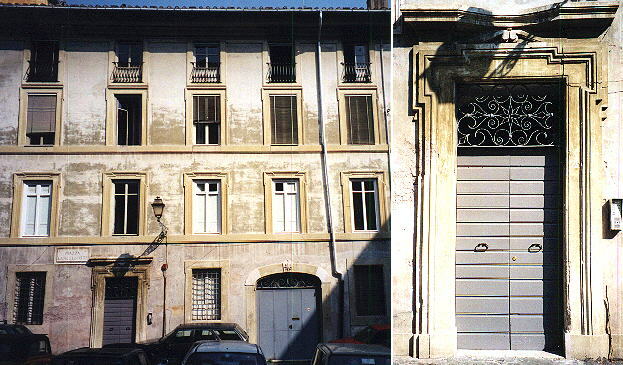 The plate shows only a corner of Palazzo Lancellotti which was begun by Daniele da Volterra and completed by Carlo Maderno. The portal is attributed to Domenichino. The street to the left of Palazzo Lancellotti is Via dei Coronari, famous today for its antique shops. It was opened by Sixtus IV in the XVth century to facilitate the access to St Peter's and it was called Via Recta (straight street). There were many shops selling devotional goods to the pilgrims including rosaries and small crowns (hence Coronari). 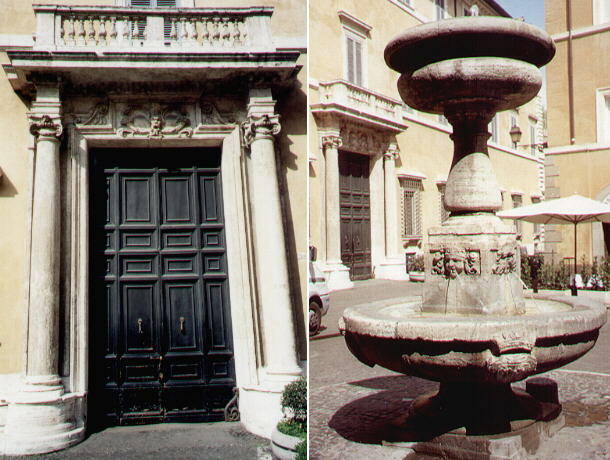 The little square in front of Palazzo Lancellotti is a 1930s addition: the fountain comes from Piazza Montanara. The houses for the servants are shown in the plate and they still bear the star of the Lancellotti. In the first half of the XVIIth century the family Cesi was among the wealthiest families of Rome. 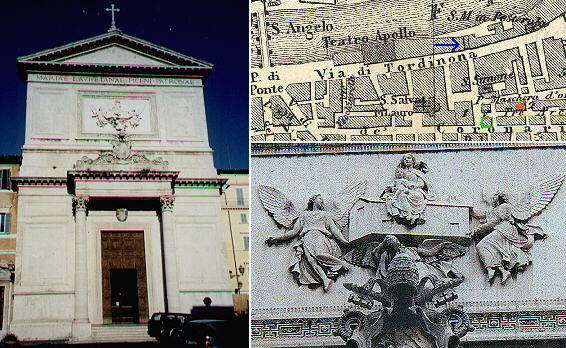 Cardinals Donato and Angelo Cesi built the façade of S. Maria della Vallicella, the duke Federico Cesi protected Galilei, another duke, Francesco Maria, married a niece of Clemens VIII and added to the heraldic symbol of the Cesi (a tree on a mountain) the stripes of the Aldobrandini. 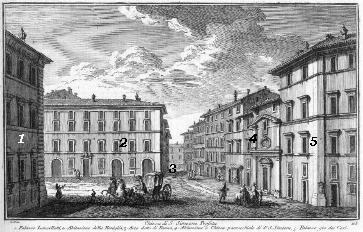 At Vasi's time the Cesi had left the palace shown in the plate, but they retained a larger palace near Piazza S. Pietro in what is called today Via della Conciliazione. The palace has a fine XVIth century portal and on a corner a gigantic head of a lion. The detail of the map shows the location of three churches near Palazzo Lancellotti. S. Maria in Posterula was a little church built in a small gate of the walls on the river (posterula means small gate) and was pulled down at the end of the XIXth century, together with Arco di Parma (marked with a blue arrow) and Teatro Apollo or Tordinona, one of the main theatres of Rome. Arco di Parma had this name because of a nearby (lost) palace which belonged to a cardinal who had been bishop of Parma. S. Salvatore in Primicerio (the red dot in the map) is no longer a church. S. Salvatore in Lauro is dedicated to our Lady of Loreto (the detail of the façade shows the angels bringing the holy house to Loreto) and it is the national church of the inhabitants of Le Marche the Italian region on the Adriatic Sea which was part of the Papal state (click here for a list of national churches in Rome). The church was restored in neoclassical style by Guglielmetti in 1862. 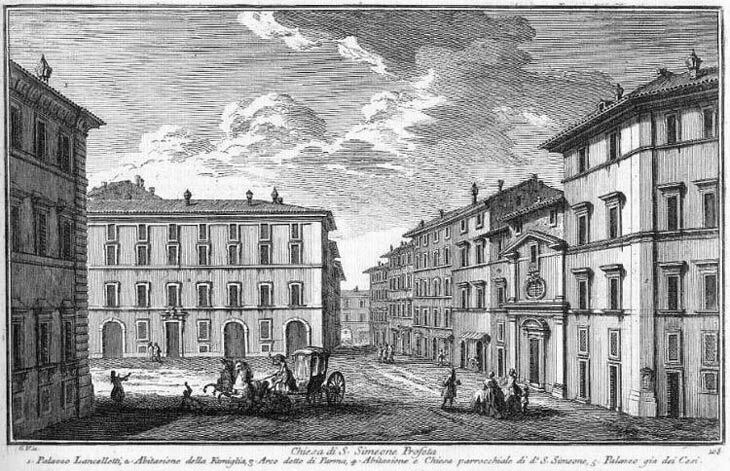 The building with a green border was pulled down to create the square opposite Palazzo Lancellotti. A little fountain, now next to S. Salvatore in Lauro and once in nearby Via di Panico, shows a worn out lion's head. The long inscription explains how a dragon (the heraldic symbol of Gregorius XIII) tamed the lion and convinced the beast to provide such a useful utility. Another fountain on the parapet along the river marks the site of Teatro Apollo. 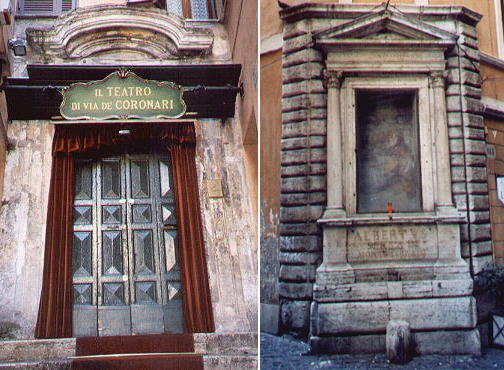 The inscription says that in the theatre two operas by Giuseppe Verdi Trovatore and Ballo in Maschera had their first performance. 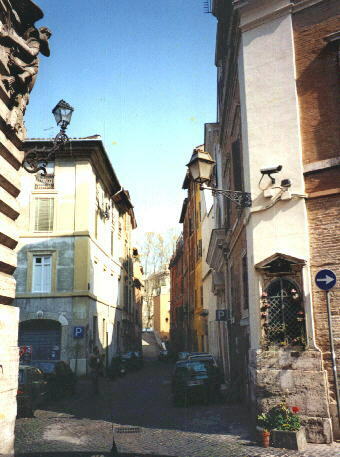 The southern side of Via di Tordinona was spared by the quaying of the Tiber. Its old and decaying buildings were occupied by squatters in the 1970s and only very recently municipal authorities were able to recover and restore these houses, some of which still retain their Renaissance features and in particular the positioning of the windows in order to provide space for mural paintings. The squatters made use of this space and one of their mural paintings which portrayed a flying donkey was spared. In Via della Maschera d'Oro (Golden Mask) there is a XVIth century palace (Palazzo Milesi) which was painted by Polidoro da Caravaggio, a pupil of Raphael. The subject of the paintings is the myth of Niobe, although many scenes were inspired by the reliefs of Colonna Traiana. The name of the street is due to a detail of the decoration showing a little boy hiding behind a golden mask. Part of the paintings were revived in 2004 (image on the left). Next to it there is another Renaissance building with evidence of graffito paintings and decorations. 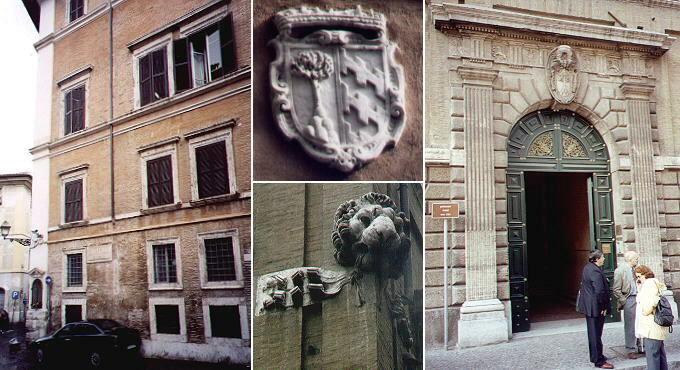 Via de' Coronari has several Renaissance buildings worth a short note. The portal of the house of Prospero Mochi was designed in 1516 and it shows some typical elements of Renaissance architecture (the use of the arch, the entablature with a moral inscription, the lateral pillars). 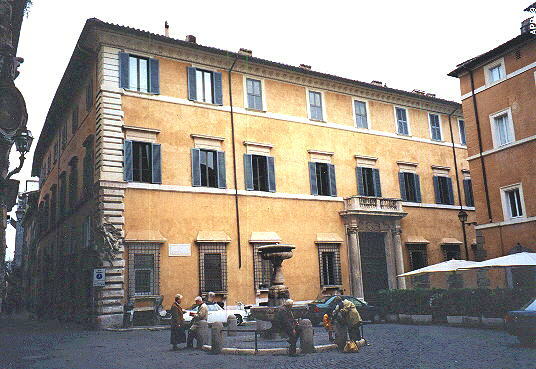 Palazzo Ruiz or Sampieri is a Late Renaissance palace attributed to Bartolomeo Ammannati. Casa di Fiammetta is a (much restored) XVth century detached house at the end of Via de' Coronari. Fiammetta is the name of a Florentine courtesan, who was "friendly" with Cesare Borgia, the preferred son of pope Alexander VI, who in turn had been friends with another famous courtesan, Vannozza Cattanei. SS. Simone e Giuda was also known as S. Maria in Monticello, with a reference a small elevation called Monte Giordano. The tiny church was deconsecrated at the beginning of the XXth century and turned into a cinema, then into a restaurant and finally into a theatre. The only thing left is the XVIIIth century portal. Via dei Coronari has one of the oldest frames for sacred images shown in the streets of Rome. It was designed by Antonio da Sangallo the Younger in 1523 for Cardinal Alberto Serra da Montefeltro (whose name is written below the image). Chiesa di s. Maria in Posterula Era questa chiesa unita all'antico palazzo Gaetani, che quì ebbe quella nobilissima famiglia prima del Pontificato di Bonifazio VIII. ma poi avendola egli conceduta ai monaci Celestini, vi stabilirono il loro collegio, che dicesi Urbano. Teatro di Tordinona Erano quivi ne' secoli passati le carceri; dipoi fuvvi un magnifico teatro tutto costruito di materiali senza legno; ma essendo stato atterrato da Innoc. XI. ultimamente vi è stato rifatto di legno sul medesimo piantato dell' antico. Go to or to Book 6 or to my Home Page on Baroque Rome or to my Home Page on Rome in the footsteps of an XVIIIth century traveller.